Rachel Von | The Journal Gazette Purdue Fort Wayne's Matt Holba shoots over South Dakota State's Skyler Flatten during the first half of Thursday night's Summit League matchup at Memorial Coliseum. Rachel Von | The Journal Gazette Purdue Fort Wayne's John Konchar jumps up to shoot the ball as South Dakota State's Alex Arians tries to stop him during the first half at the Coliseum on Thursday. South Dakota State has been the Summit League team to beat for years. The Jackrabbits won the league the last three years with the league's best player, Mike Daum, putting up flashy numbers. 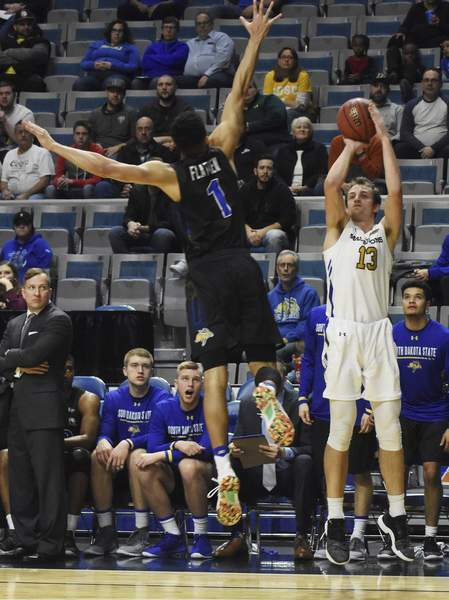 Purdue Fort Wayne coach Jon Coffman knew his team had to go through the Jackrabbits (11-6, 1-1 Summit League) to be a force in the league. 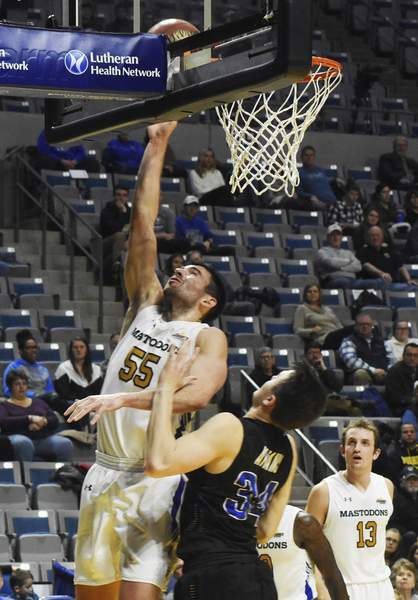 With a handful of NBA scouts in attendance to watch the league's two best players in Daum and PFW's John Konchar, the battle didn't disappoint, and it ended with the Mastodons handling the league powerhouse 104-88 at Memorial Coliseum on Thursday night. PFW (11-7, 3-0) executed an aggressive game plan on Daum, trying to make the 6-foot-9 forward uncomfortable. Holba spent time guarding the two-time Summit League Player of the Year and credited the team's defense. Daum still had 29 points on 21 shots. Coffman's team quickly extended a five-point halftime lead. The first six PFW baskets were 3-pointers and Holba scored nine points in less than five minutes. He finished with 20. The Mastodons had five players in double figures with Kason Harrell and Konchar leading with 23 apiece. Marcus DeBerry, who's come alive since coming off the bench in early December, had 15 points and Dylan Carl added 10. “We play unselfish and when we play like that, it just makes the game more fun for everyone and we did that for 40 minutes tonight,” Harrell said. PFW went 9 of 18 in the second half from the 3-point line and 17 of 39 overall. Konchar also had eight rebounds and eight assists coming off his career-high 38 points at North Dakota State on Sunday. But the sudden emergence of players not named Konchar and Harrell has made PFW the new team to beat in the Summit League. “I feel like if we can make this our standard coming into conference play, than we'll be fine as the season goes forward,” Harrell said.